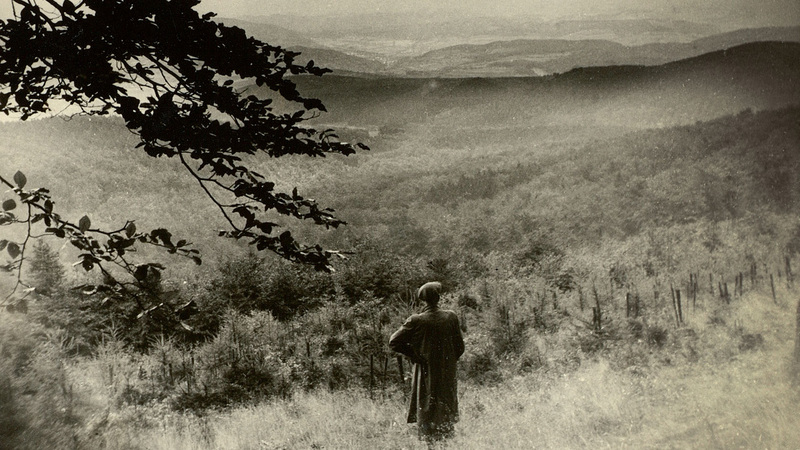 Jürgen von der Wense in the Kaufungen Forest, North Hesse, Germany, circa 1953. Photograph from the archive of Heddy Esche. Translated by Kristofor Minta and Herbert Pföstl; edited by Kirston Lightowler and Herbert Pföstl. Composer, translator, folklorist, aphorist, poet, and wanderer Hans Jürgen von der Wense was born on the 10th of November 1894 in Ortelsburg, East Prussia. One day before his seventy-second birthday, Wense died in Göttingen, Germany. He left behind numerous diaries, three thousand photographs, six thousand letters, and many thousand loose sheets of writings on natural history, mineralogy, poetry, folklore, and music, to name but a few of the subjects that were a focus of his studies. These writings were filed in hundreds of binders, arranged alphabetically, and comprised three major works: Epidot, a collection of fragments, the Wanderbuch, on his walking, and the All-book, an encyclopedia. A brilliant polymath and aphorist, Wense aspired to create the All-book from his extensive writings. An encyclopedia arranged by keyword, it would collate his aphorisms, adaptations, and translations from more than one hundred languages, including those of the Middle East, Africa, Asia, South America, and Oceania. It would also include his detailed interpretations of the myths, poetry, and philosophy of ancient cultures. The folders for the All-book were in a constant state of reworking and regrouping, part of an endless process of editing and expansion. Ultimately this monumental work was never finished and Wense only published about fifty pages of text in his lifetime. A Shelter for Bells will be the first book of Jürgen von der Wense’s writings published in English.